We didn’t want to go to France. 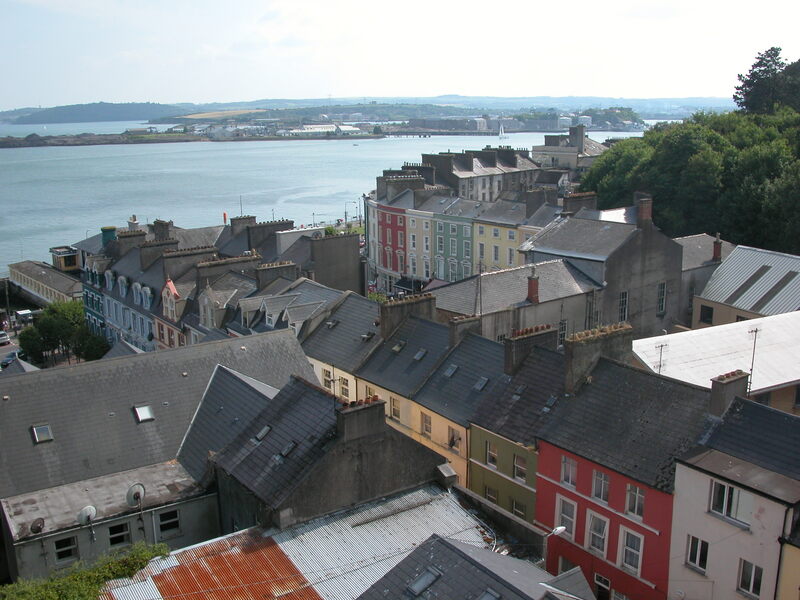 We wanted to spend a couple of hours in an Irish town called Cobh. Apparently there was more than one ferry in this place! Once we explained that we wanted to remain in Ireland and were looking for a small river ferry, the attendant got out of her kiosk, lifted a gate and walked us to an exit lane. She told us where we wanted to be, and we were on our way again. there – hmm. 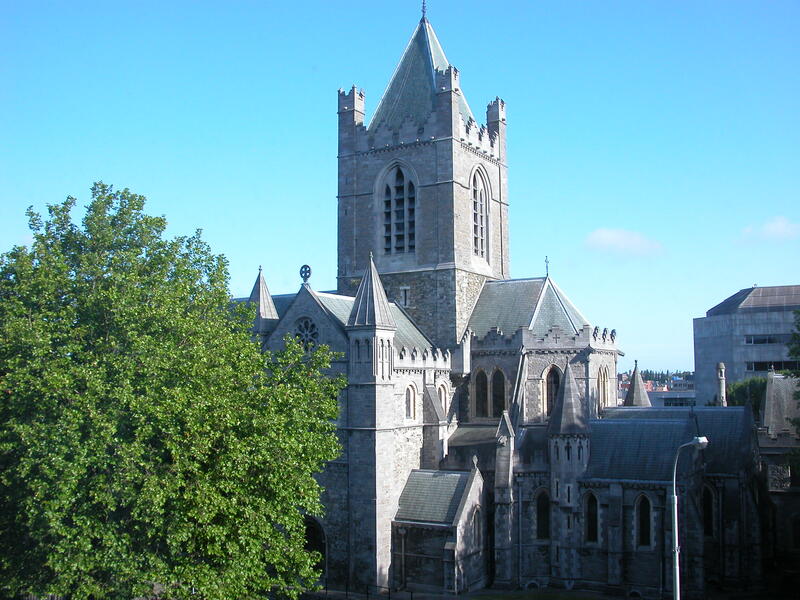 I think I’d find a new departure city if I were traveling by boat), climbed the hill to wander through St. Coleman’s Cathedral, ate ice cream, drank coffee, and wondered why we had never heard of this city before. 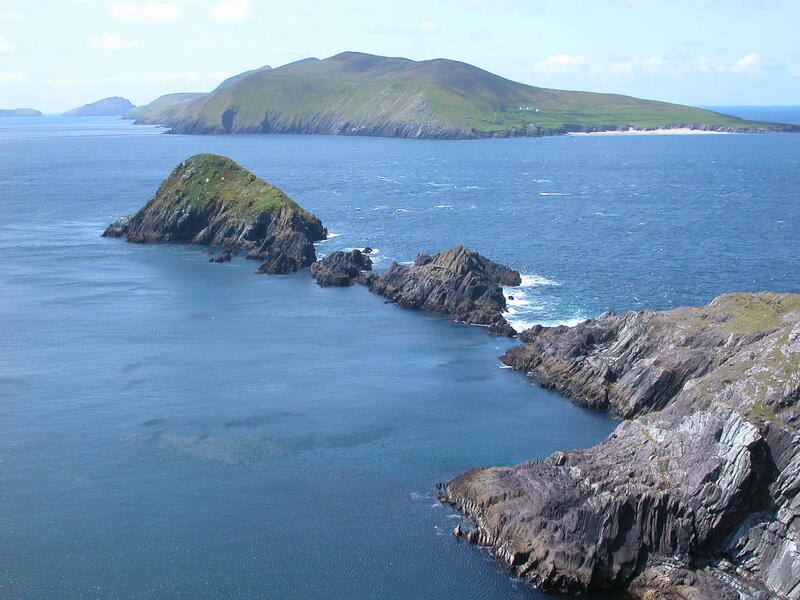 Then it was back in the car for a drive to the area where all of my traveling friends said we must visit – the Dingle Peninsula. And of course they were right. Every turn on that narrow road produced another gasp from both of us – the rocks, the waves, the different shades of blue – light, dark, purple, navy, royal, powder — were both in the sky and the water as it crashed toward the jagged rocks. At one point we climbed a hill and walked into a pasture full of very calm sheep. At another point we explored one of the “bee hive” dwelling places of an ancient civilization. This is the advantage of having a car instead of being bound to a bus schedule. When we wanted to climb a hill and look down on the waves crashing the coastline, we could. When we wanted to stop into a pub for some soup to warm us from the cold wind, we could. Wherever we stopped the people were friendly and helpful. They gave good advice on what to see, where to eat, what to avoid. We spent a day taking in the sights of Dingle, then headed to another place our friends recommended. 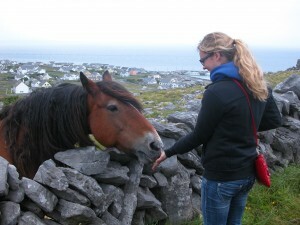 We wanted to hear some authentic Irish music, and we wanted to see the Aran Islands, so Doolin was next. For all that we had heard about Doolin, we were surprised at how tiny it was. A few streets had shops and restaurants, but that was it. There were a lot of new housing tracts, but the houses appeared to be empty. It was as if the village planners heard that a great expansion was coming, and got ready for it, but it never came. 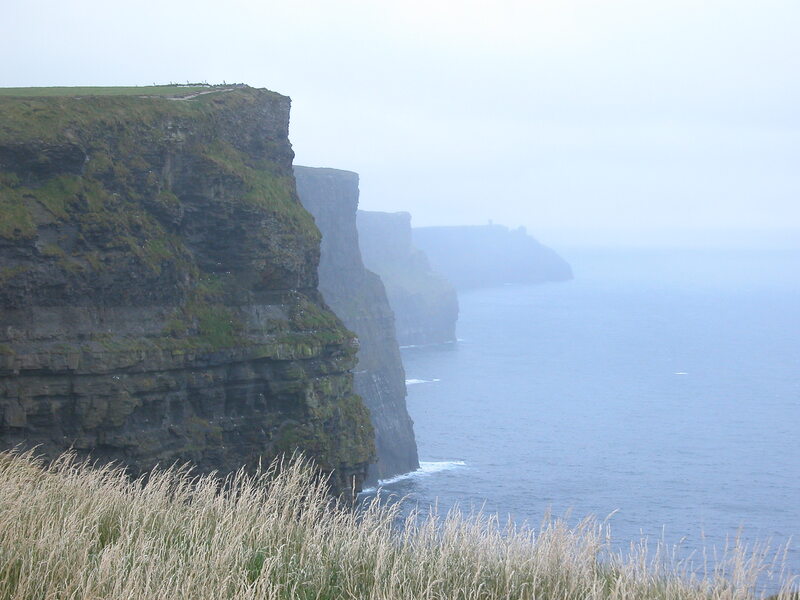 The next morning we visited the Cliffs of Moher, which are solid walls of stone rising up from the ocean. Where the Dingle Peninsula had occasional beaches that sloped upward to higher peaks above the water, there is nothing gradual about these cliffs. They are straight up and down, and down is several hundred feet. It was as if someone had built a gigantic wall around this part of the island. And we felt great solidarity when we saw a sticker for Hodad’s, the great Ocean Beach hamburger place, on the gate of a walking path. Then it was off to the Aran Islands. Even though they are visible from Doolin, and even from the Cliffs of Moher, it’s not an easy boat ride to get there. It took only 30 minutes, but it was like a 30-minute roller coaster ride called Lost At Sea. The waves were high and so was the wind – we pitched forward and back, left and right for the entire trip, in pouring rain. 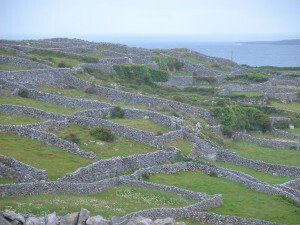 The Aran Islands are described as what Ireland was like 50 to 100 years ago – stone-covered, not densely populated, with property marked by low fences made of the stones that stick up out of every field. It looks like the fields were planted with rock seedlings, and now they’re ready for harvest. If rocks were edible, Ireland could feed the world. Thankful that we had taken the boat ride on empty stomachs, we found a pub and sat down just as the patrons started singing. One middle-aged man sang a bawdy song about Viagra. A couple of younger laborer-looking lads sang some even more off-color songs, to the great cheering and stomping of the patrons. Then a high tenor voice came through the noise and bar became silent before it. An older man – I’d guess in his 70s — started singing a ballad in Gaelic. When he was done, the bar erupted in applause and cheering, and the bartender sent him a pint. It was still morning. 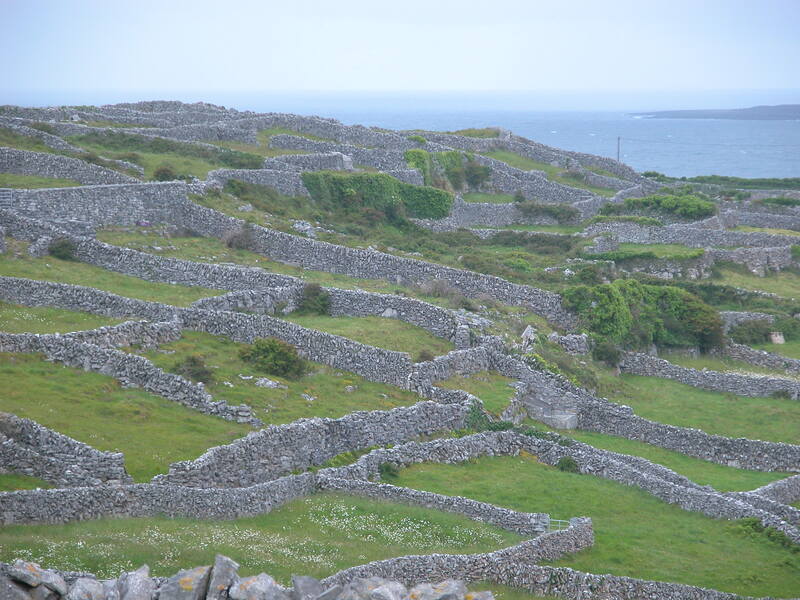 We walked through the entire island – population 300 – along the labyrinth of low stone walls. At one point a horse trotted overto us and nodded several times. Vanessa pulled out some packets of sugar she had taken from the pub, and poured the contents in her hand. The horse leaned his head over the stone wall and licked her hand for several minutes. When he was done he nodded some more. So she got out some more packets. This happened three more times. Then he trotted away. Maybe to find a dentist? During the last hour of our time there we rented bicycles and explored other parts of the island. There is the shipwrecked hull of a freighter that washed up on one shore, the ruins of a Napoleonic signal tower, all under the dark, rain-heavy clouds that parked overhead. When we headed back to Doolin at the end of the day, the sea was still choppy, and many of the people who had started out the trip in the ferry’s cabin came out to the back deck to get sick over the railing. Seeing others vomit is one of Vanessa’s least favorite things (I forget where it is on my list), so when we were crowded on the deck, and the girl directly behind us began hurling into a bag, I positioned myself so that Vanessa could not see it. Eventually, though, it became obvious even to her. Props to Vanessa for not pitching herself (or the other girl) overboard. Back in Doolin we found another pub and saw that traditional Irish music was being played by very young people – they looked Vanessa’s age. They were using the old instruments, like a tin whistle, fiddle, uilleann pipes (like a small bagpipe), an accordion, a bodhran (a hand-held drum) and guitar, and the sound felt like it was taking us back several generations. We sat at a table and watched and listened, and then an older man, who walked with braces on his legs and crutches, stood up and slowly walked toward the band. He began to sing, and they caught on immediately. It was an old, sad love song, and I felt like I was witnessing a Frank McCourt moment, where everything froze for those minutes while true Ireland was briefly revealed. The cheering, whistling and stomping followed the old man back to his table. We made it to Dublin and had a day to get Vanessa situated for her summer stay. I had to remind myself to let her find the correct bus, have the correct change, and find where she’d be going to school. The dad in me had already figured it out, but that wasn’t the point. We found her school, then did some shopping. Grafton Street was fun, but pricey. The stores worth shopping in were on Henry Street. I walked out of one store and nearly ran into a statue of James Joyce. This is one of the amazing things about Dublin. They honor their writers. There is a Dublin Writer’s Museum, a Literary Pub Crawl, and statues for Oscar Wilde and Patrick Kavanagh throughout the city. A cab driver pointed out the building Bono stays in when he’s in town. This got me thinking about other cities I have visited. When I was in Guanajuato, Mexico recently, I saw a statue of the artist Diego Rivera, along with many statues of Don Quixote and Sancho Panza because of the annual Cervantes Festival there. In Skopje, Macedonia there is a statue of Mother Teresa in the city square, where she was born. In San Diego, there are statues of real estate developers. What a cultural gift they’ve been. Vanessa and I did some grocery shopping to get her through the first week of apartment living, and then it was time to wrap up our trip. We ate our last dinner together in the Temple Bar area, and talked about her summer ahead. She didn’t appear nervous at all. Then we talked about grad schools and somehow got into the plots of the Christy MiIler books. Occasionally my mind wandered a little. She had found this program on her own, had taken care of all of the details herself, figured out her housing, agreed to room with total strangers from around the world, and was going to be spending the summer in a country she’d never before visited, studying a topic that has vexed the Irish people for generations. It dawned on me right there, that night, that I was speaking to an adult. Walking back to the hotel we stopped and watched some young musicians play Jimi Hendrix’s version of All Along the Watchtower. One of the guys was playing a guitar he had made. The body of it was a gasoline can. They were smoking. 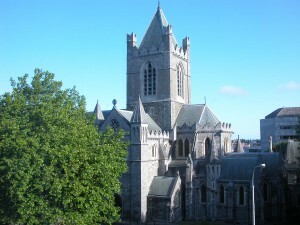 That night the Christ Church Cathedral, which was directly across the street from our hotel, woke me up at 1 a.m., then again at 1:15, and again at 1:30, and on through the morning, meaning half my night was a series of 14-minute naps. I was already nervous about leaving Vanessa in this country. I wondered if this was how I was going to sleep for the rest of the summer. Later in the morning a cab picked us up from the hotel. He typed the address of Vanessa’s apartment into his GPS and we sped through Dublin rush-hour traffic. The driver wanted to talk about episodes of the Simpsons that we might have both seen, but I wanted to ponder one more time what I was about to do. I was going to leave my daughter in an apartment in another country, with roommates she’s never met, going to a school I’d never heard of. We pulled in front of her apartment. It wasn’t really on a street – more like an alley. I noticed that the front door was covered by a spider web. We knocked on the door and rang the bell. No answer. I looked at my watch. I had a plane to catch. She pulled out a copy of Diary of a Young Girl, by Anne Frank. I hugged her goodbye, got in the cab, and watched through the window as she slid against the front wall to a comfortable reading position. She waved once more. What father would leave his daughter by herself in front of an empty apartment in an alley, while she read about Nazis? I couldn’t shake the feeling that I had left her, vulnerable, and that if something happened, it would be my fault. Fear took over. About an hour later I got a text from her. The roommates arrived. She hardly had a chance to read her book. She sounded happy. On the plane headed home, I thought about Vanessa’s book choice as I was leaving her in Dublin. Anne Frank? A story of suffering and genocide? Then I thought some more. It’s more than that. It’s about a girl’s courage and wisdom and insight, too. That sounded more like it. Dean, I’m tickled to have stumbled across your blog this Friday morning, when I am exhausted from a week of hot sunshine and late nights and I want nothing more than some good stories to read while I nurse my coffee. I am an American mutt, but the largest slice of my ancestral pie traces back to Ireland. We still have relatives in County Down. I’ve never been, but it is on my list. Reading this piece both satisfied my longings and increased them. I hope and pray your daughter has a magical, inspiring, growing time during her semester overseas. What a kind note!Ireland was spectacular for both of us. Can’t wait until I get to go back!